Tom - I read just recently, somewhere, that a Bald Eagle was seen along the Stillwater River not far from West Milton. I wonder if this is new "news" or old news and people are just hearing it? In any event, the possibility exists, I guess, that one could possibly land here but if it would be looking for fish I would be out of luck in being able to keep it coming back. I didn't know what they eat, except fish, so never thought I could entice them to stop with sunflower chips and pieces. 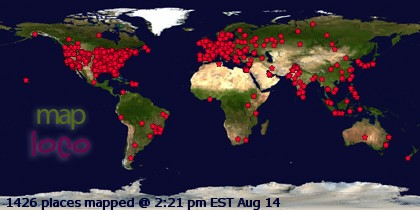 I have seen all of these birds you portray today in your post. I also have seen the White-crowned, White-throated, Song, Chipping, Tree, Field and others I have since forgotten about. When I sometimes look back over older photos, especially those of birds feeding on the ground, I will realize there are birds feeding there that I have never seen before. I need to begin to pay more attention. I love the subtle colorations of the Sparrows.All of them show up here in spring,which I hope is soon.Jake and I also have the 100-400mm Canon lenses and love them.We have had them for about a year now. Dan- Thank you very much! Abe- I'd love to get a decent image of a white-crowned sparrow. Yep, finding cool birds is all about looking at the details. Ruth- Thanks. They'll be here soon. 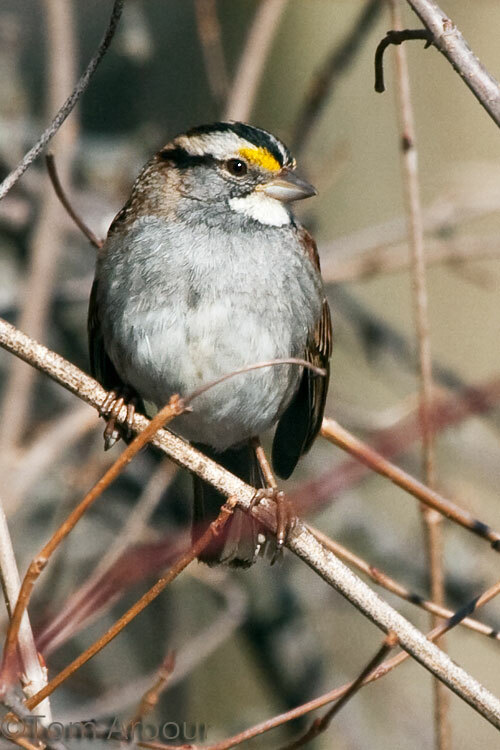 I suppose your white-throated sparrows leave for the winter, while we get them for the winter. The Canon 100-400 a great lens for walk around bird photography. Very nice! How much was your lens? Great images, Tom. 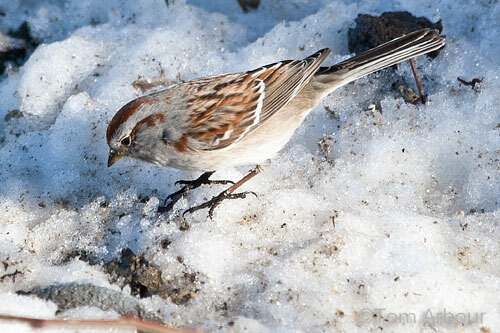 These are the 3 most common sparrows at our feeders every winter, that's for sure. It's taken me several years to be able to tell them apart at a quick glance, but I feel pretty comfortable making their IDs now. As more and more birds make their way into these latitudes, I'm going to be wishing for a long lens again, though! I wish that I was able to get these species of sparrows at my feeders- An occassional song sparrow will show up, and juncos are prevalent, but I don't have enough habitat to pull in the white-throats. What is your longest lens? 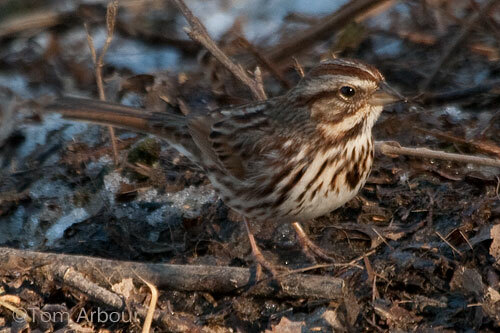 Song sparrows and juncos are good to have in the yard. Our junco population has dropped dramatically over the past few years, though. My longest lens is a 55-200 zoom, and it's slow at that, so no good for low light. These are things I did not know about when purchasing my camera. Oh well.